One of the risks of writing a book about the current economic situation is that, because the process inevitably involves a considerable time lag between writing and publication, events move on and the book can seem out of date as soon as it hits the streets, as it were. In my case, this could have happened if the economies of the ‘developed’ nations really picked up and prospects started to look much better than they had done three years ago, when I started this book. But in fact, I felt fairly confident that what I was saying would hold true for many years, because I was writing about the fundamentals of economics, as much as about recent trends. It might indeed seem that some economies are finally picking up after the long recession, with the IMF recently forecasting modest growth in most western economies (though not in most of Europe). But comparisons with past recessions will show that this is still, after six years, a very slow recovery, and in some cases a non-existent one. The reasons for this, I feel quite sure, are as explained in my book. The UK is apparently leading this modest recovery — unemployment, as in the US, continues to edge downwards, and GDP figures are picking up. But how true is this? 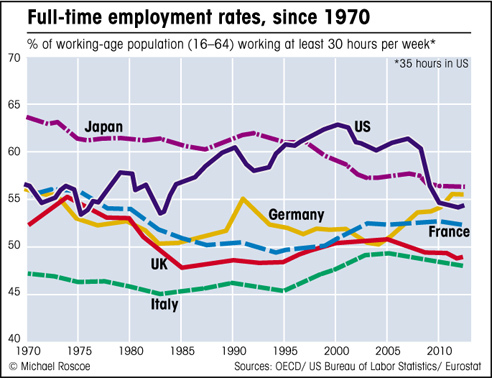 Employment in real full-time jobs has barely picked up at all, and if expressed as a percentage of total population, is still falling. 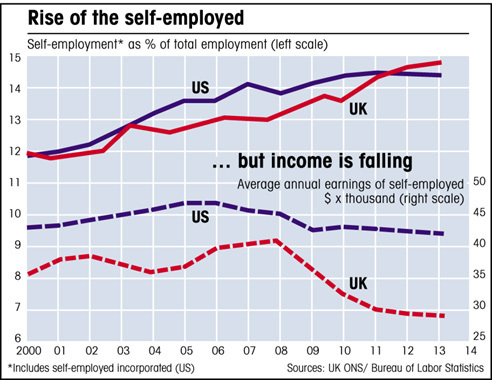 The apparent gains are mostly in either part-time work or in self-employment (see charts). Many workers have given up looking for decent jobs and are making do with anything they can get, and going self-employed is one way of trying to make it in this post-industrial society. But it is often very hard to earn a living this way, which is one reason why wages are still falling in real (inflation adjusted) terms. And as for GDP figures, I demonstrate in my book how output figures are boosted by spending based on credit, and even by the creation of the loans themselves – there is actually an internationally agreed formula that translates bank loans into national output, so the more money banks lend, the greater the boost to GDP. The UK, more than any other major economy, is heavily dependent on financial activity, in particular on the creation of credit. It is this activity, combined with an influx of wealth from the Middle East, Far East and Russia, that is pushing up property prices in London and the southeast of England, and to a lesser extent in Paris and other cities that are popular hang-outs for the world’s billionaires. The inflation of asset prices due to credit-based financial speculation is unsustainable, for reasons I explain in my book – in the end, all debts must be repaid. This means that such a boost to GDP is borrowed from future earnings – it is one of several related reasons why future generations will inevitably be poorer. It just isn’t possible to create wealth out of nothing – an obvious point, I know, but that is what the financial sector tries to do when it gets into highly-leveraged speculation and unproductive credit creation, rather than genuine investment in productive industry. If there is no real industry involved, then there is no real wealth creation either. Have we learned nothing from the crash? It seems that the UK is the most deluded in this regard. More than any other major economy, Britain relies on financial wizardry – the attempt to profit by leveraging the accumulated wealth of past industry, and by sucking in wealth from those parts of the world that still produce real stuff. This financialization of the economy is the major reason for the rising inequality that is currently in the process of wrecking our society. It is no coincidence that London, the world’s financial capital and home to many of its wealthiest people, has a rising poverty rate and a massive (and widening) earnings gap; as the financiers get richer, everyone else gets poorer, because the bankers aren’t earning money through real industry that leads to job creation and a virtuous circle of wealth distribution (as happened in the days before bank deregulation) – they are taking it from other people, mostly the middle classes, and in the process they are raising the cost of housing by investing in property. The government encourages the process by keeping top tax rates low and cutting benefits, while at the same time using taxpayers’ money to save the banks through quantitative easing, which as well as being equivalent to printing money, is also a transfer from the poor to the rich, paying off private-sector bank debts with public-sector funds. Bankers have become the greediest of all society’s parasites, sucking the lifeblood of wealth from the real economy. And in saving the banks from their own failings, governments have rewarded those same bankers twice over – not only were they rescued at no cost to themselves, despite the fact that it was their own greed that caused the crash, they are also given public money so that they can continue to profit from credit creation, resuming the debt cycle that got us into the mess in the first place. How long before the next banking crisis? 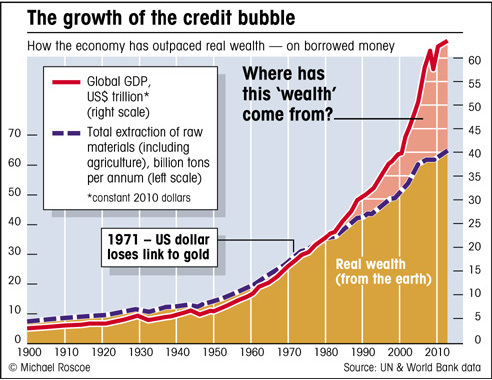 The reason I started writing this book is that I came across data that demonstrated clearly how the credit bubble was inflating global GDP figures way beyond the genuine underlying wealth-creating activity that was supporting the real economy (as shown below). And what we find now, six years after the crash, is that exactly the same thing is happening again, especially in Britain. The credit bubble didn’t go away after the crash, it merely deflated slightly, and now, as the Bank for International Settlements has already warned (see here), the bubble is growing beyond even the previous peak. In my book I demonstrate why money, in US-dollar terms, is currently overvalued relative to the real underlying wealth creation of the global economy, by a factor of around one third. 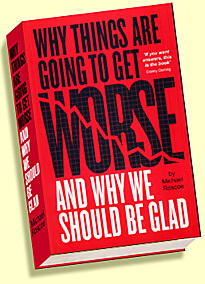 In other words, one third of all wealth in the world is based on debts that are not backed by real wealth, and will have to be repaid from future earnings, making the world poorer than current wealth figures imply, and in the process raising the cost of real stuff – commodities in particular – by at least a third, relative to earnings, which for the majority are declining.